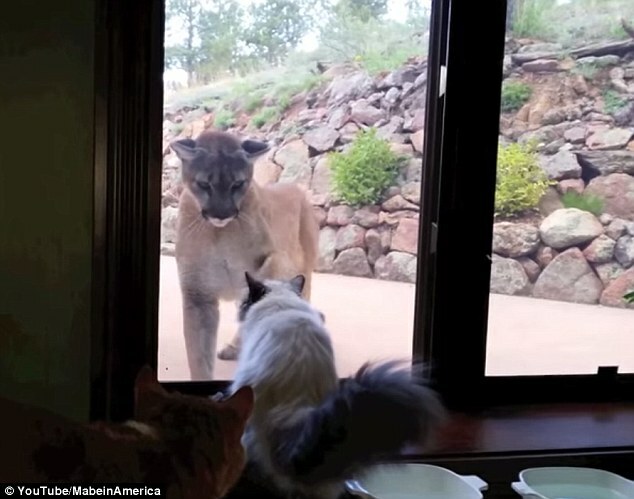 A fearless house cat was spared one of his nine lives when he stood up to a mountain lion with only a window pane between them. Despite the fact that the lion was much bigger, stronger and more fierce than the pretty Himalayan, the long-haired kitty showed no fear as the lion glowered at him from only inches away. The video was posted to YouTube by owner and comedian Tom Mabe who runs a prank channel called MabeinAmerica. Mabe lives in Louisville, Kentucky, where the video appears to be filmed. The brave kitty shows not an ounce of trepidation as the lion looms over him, gigantic paw in the air. 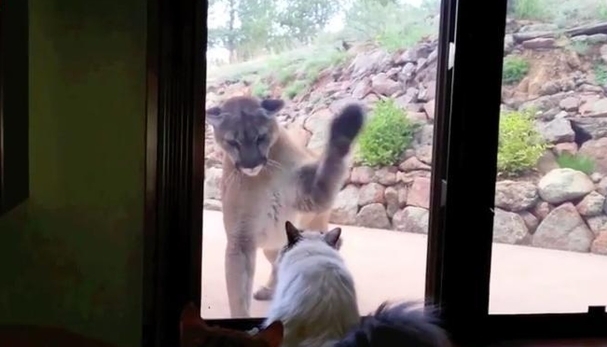 Responses to "Fearless house cat has close-up encounter with mountain lion"